I am sure you have heard me talk constantly this year about how my family is really making the effort to improve our health. Both my husband and myself have a poor family history as far as health goes and honestly I really want to break that cycle now while we still can. I have so many goals and dreams for the future and I would like to actually be able to see them through! Recently I was given the opportunity to review a product that many of you may have heard about Krill Oil. Everest Nutrition’s Krill Oil is extracted from Krill living deep within the waters surrounding the Antarctic. Krill are very small, shrimp like crustaceans found in open seas throughout the world. Research from the scientific and medical communities confirms the incredible effects this oil can have in promoting heart and joint health, lowered cholesterol, improved moods and comfort during menstruation. With all the great things I have read about Krill Oil I was very excited to get to reviewing this. Since beginning to take it 3 weeks ago I cannot say that I have seen MASSIVE changes but my joint pain has been less. I hope that as I continue to use it I will notice more of a difference. I know that the Omega-3 contained in krill oil is working inside my body to help reduce my risk of heart problems which is rewarding in itself. Read more about Everest Nutrition's Krill Oil HERE and if you are interested in giving it a try for yourself make sure to comment below for a chance to win. What are you doing to change your life?? Both parents have had cardiac health issues. I have a vascular health issue (as I have DVT). I make sure I try to take fish oil each day. I aim interested in the anti inflammatory properties of Krill Oil. I have been working hard to be healthier this year, you and I seem to be so much a like which is why I love your blog. I will check this out, it would be nice to not hurt as much after a normal day of taking care of the kids. My resolution for this year was to add more healthful ingredients to our meals. Some of the things I've done straight out, like serving a LOT more veggies, others are a little more sneaky, like adding more veggies or even flax or hemp seed to a dish without telling anybody. So far, so good! It's the little things that add up. 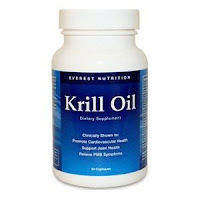 I have tried Krill oil before but not this brand, I'll have to try it again!